Numerous studies done by ASHRAE and other indoor air quality experts, suggest an optimum relative humidity (Rh) range of 45 to 55%. Too much or too little moisture can cause a variety of health threats and illnesses. 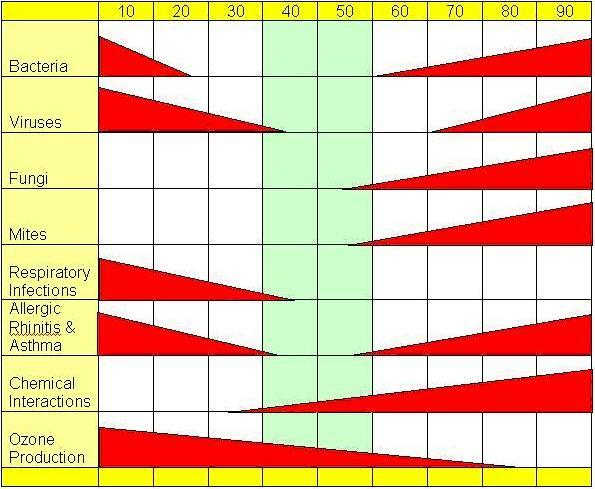 This chart shows the humidity levels at which the listed microbes and health problems are likely to flourish. As the width of the bar increases, indoor air quality diminishes and potential health problems increase. For example, virus growth is unsupported at humidity levels of 50% to 70%, but its growth rates steadily increase above and below this range with maximum growth at 0% and 100% relative humidity.